By his own admission, Rabbi Moshe Rosenberg is the kind of teacher who sometimes presents material that is a bit over the heads of his students. But the students probably don’t mind because they are proud that their teacher thinks they are at the level at which they can understand him and will do all they can to rise to that point, feeling flattered that their teacher has faith that they can comprehend. That is pretty much how a reader should approach the Unofficial Hogwarts Haggadah. Ostensibly written to help Jewish Harry Potter lovers of all ages “connect the dots” between values they know from Judaism and the situations that are presented in the Harry Potter books, in fact the Unofficial Hogwarts Haggadah, currently a best seller in Haggadot, Jewish Life and Holidays categories on Amazon since its release March 13, is a book containing thoughtful and sophisticated commentary in a form that will be mostly accessible to readers of all ages. 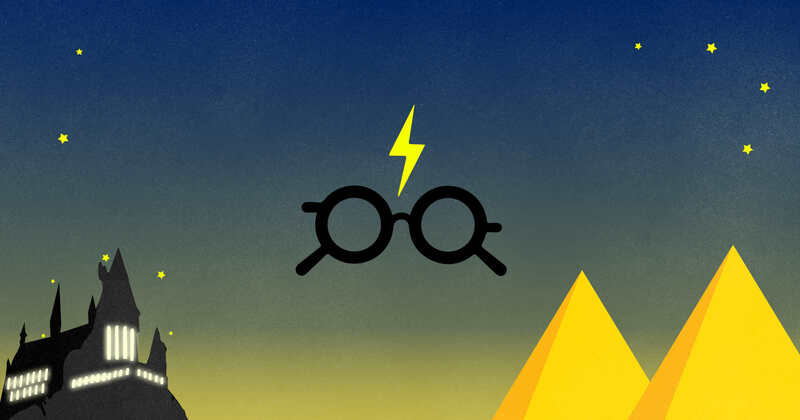 Since the writing is cloaked in the guise of the wizarding world and its magic and spells, no one will mind if they can’t comprehend each thing; in fact Rosenberg, with his humor and good cheer, will probably encourage readers to learn new things and think new thoughts, willingly and with excitement. Rosenberg teaches fifth grade Judaic studies and Judeo-Tech integration at the SAR Academy in Riverdale, NY and has been a rabbi at Congregation Etz Chaim in Kew Gardens Hills for over 20 years. In a phone interview, he opined that his favorite part of the seder is the plagues, but prefaced his answer by saying “ooh aah” with excitement at thinking about the query. He added, “This is going to sound strange but I am mesmerized by the makkot(plagues). Over the years, I have researched and learned so many different patterns underlying the makkot, and every year I find something else. My fifth graders suffer through material on an adult level. I have the podium.” If a reading of the Haggadah this teacher has produced is any example, it seems clear the students are okay with following their teacher’s explorations and line of thought. Rosenberg gives his own thoughts on who is a good teacher in the Unofficial Hogwarts Haggadah. The rabbi writes that, “The best professors at Hogwarts were the ones who invited questions, like Remus Lupin or Albus Dumbledore. Snape, out of impatience, Umbridge, out of superiority (or was it insecurity), and Trelawney, out of incompetence, evaded questions. Their inaccessibility not only made it harder for students to learn, but made it almost impossible to develop a relationship. Judaism recognizes the meeting ground of sincere questioner and unintimidated respondent as fertile soil for forging a relationship between generations.” In fact, Rosenberg recently wrote an appreciation of his own teacher Rabbi Hershel Schachter and discussed many of these qualities. Of course, the most important teacher any child can have is a parent and Rosenberg explains that “Parents are obligated to engage with their children on this evening, and are even given a script to get the ball rolling.” Perhaps this Harry Potter Haggadah, can be as useful to parents as to their offspring? Visually By Myself With Kahoot! Rosenberg explained in an interview that, for his students, a core lesson is, “You can find guidance and inspiration for the service of God in all parts of your life. Not just sacred texts, not just classical literature, in popular literature” and that his desire is to help his students, “connect the dots, set up with a habit, enrich their lives going forward.” Rosenberg preceded this Haggadah with a volume Morality for Muggles. This volume came about because, before the seventh Harry Potter book came out, he wrote a piece for the New York Jewish Week in which he said, “By training our children to find morality in the world of muggles and wisdom in the world of wizardry, we just might keep them religiously spellbound for a lifetime.” An editor at the KTAV publishing house saw the piece and asked if he would do a book on the topic and he complied. He has written both Star Trek fan fiction and articles on the Jewish aspects of Star Trek. In explaining the structure of the Haggadah, that in telling the tale of freedom from Egyptian oppression, Rosenberg quotes the Talmudic injunction of the “trajectory–“One opens with the negative (genut) and concludes with the positive (shevah).” He compares this to Harry’s life by saying, “The love that Harry bears for Hogwarts and the Wizarding world is intensified by the fact that he begins each book living with the Dursleys and experiences his own annual exodus from oppression to appreciation. In effect, each novel begins with genut and builds to shevah.” This analogy can bring home the purpose of the Passover story to all readers, in a clear way. So, what if there were a magic wand and, with a spell, a parent could throw a Seder that would engage her child completely, having her ask questions and debate ideas about freedom and what it means today? Barring a charm to expel hametz and clean our houses automatically, the Unofficial Hogwarts Haggadah and the hard-earned, not magical wisdom of its author, seems the closest thing the Muggle world has to create Seder night magic.